The power to shape society, spark innovation and move culture. That’s what Peck School of the Arts offers to our entering freshmen class each year. As entrepreneurs, our students approach challenges with innovative thinking and establish sustainable solutions to social challenges. As one of the nation’s top 115 research universities, our student artists receive the support needed to positively affect, and engage, the greater community and the world. To apply, first review the list of required materials below. A Peck School of the Arts representative will contact you to review your application once it has been received. Prepare for your two personal statements on the UW application that speak to who you are as a person, beyond your test results and high school record. The first statement should focus on your life experiences and the impact you will have at UWM. The second provides an opportunity to share your academic successes or explain circumstances that might have affected your academic performance in high school. Send official transcripts directly from your previous school, for all high school and college level work. If you are still in high school, be sure to also list your senior-year classes on the application form. Send ACT or SAT test scores. When you take either exam, select UW-Milwaukee (ACT school code: 4658; SAT school code: 1473) to have your scores sent directly to us. Pay the one-time $50 application fee. Fee waivers are sometimes granted on the basis of financial need. Please be specific in stating your reason for requesting a waiver. *Make sure you select an intended program from the Arts (Peck School of the) degree list, even if undecided. If you check the undecided box at the top of the UW application, our school will not receive your information. To be eligible for department-level scholarships, incoming new freshmen & transfers must complete the requirements below by December 15. Portfolios will be accepted after this date for general admission to the department. Provide 8-10 examples of artwork you created in the past two years. If your portfolio includes drawings, we recommend that you include at least three drawings from observation (not photographs). Identify each image by media, size, and year of completion in a separate document. JPEG files at 2000px max preferred. Upload a one-page pdf that describes how your interests and past experiences relate to your intended college choice and career path. Students who have little to no prior formal art training are encouraged to write a more extensive statement. To be eligible for acceptance into the Dance BA or BFA program, students must first complete a successful audition. If unsuccessful, students may re-audition, but are limited to auditioning twice per academic year. Transfer students must complete a minimum of half of the required dance credits while in residence at UWM in order to graduate. Students interested in department-level scholarships must audition by March 1 for priority consideration. Upload a one-page pdf that describes how your interests and past experiences relate to your intended college choice and career path. No further steps are required to be eligible for acceptance into UWM’s Department of Film, Video, Animation & New Genres. However, incoming new freshmen interested in applying for scholarship aid should complete the requirements below by December 15. To be eligible for acceptance into any Music program, students must first complete a successful audition. Please submit all application materials at least 2 weeks prior to audition date. Students interested in department-level scholarships must audition by March 1 for priority consideration. Theory & Piano Placement Exams | All new freshmen are required to take Theory and Piano Placement exams on the day of their audition. Those with prior piano experience must perform a short composition that best demonstrates their keyboard skills. All Theatre and Theatre Education programs require a successful audition or a placement interview prior to enrollment. Please submit all application materials at least 2 weeks prior to audition date. Upon acceptance to the university, students may declare a Theatre Minor without audition or interview. Upload a one-page resume detailing your performance experiences and extracurricular activities, and a one-page statement that describes how your interests and past experiences relate to your intended college choice and career path. Upload one current photo of yourself (*acting/musical theatre majors only). Instructors and/or employers familiar with your theatre experience and/or academic ability should email confidential letters of recommendation to your degree program’s area head. Acting: At least 1 confidential letter should be sent directly to Rebecca Holderness at rph2@uwm.edu. Musical Theatre: 2 confidential letters should be sent directly to Sheri Williams Pannell at pannell@uwm.edu. UWM is the top transfer destination in the University of Wisconsin System. If you attended a UW System school or Wisconsin Technical College, and would like to begin to evaluate how your courses may transfer, you can use the Transfer Information System or utilize the Transfer Equivalency Database. More information available on UWM’s transfer page. Transcripts from all institutions of higher education, technical colleges, schools, and programs (except UWM) should bear an official embossed seal and remain unopened/untampered in the institution’s original envelope. New freshmen must submit ACT or SAT test scores. When you take either exam, select UW-Milwaukee (ACT school code: 4658; SAT school code: 1473) to have your scores sent directly to us. A graduate education at UWM is more than just a degree. It’s an experience. Whether you are interested in a professional master’s degree or advancing your career with a certification, you can be confident in knowing that we are just as committed to your education as you are. 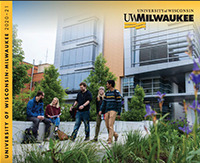 Prospective graduate students must complete and submit an application to UWM’s Graduate School. Prospective graduate students must complete and submit an application to UWM’s Graduate School by January 15th. The most substantive parts of the application include work samples (see below), a written statement of intent, and curriculum vitae. Submit URLs and passwords (if password protected) for two time-based work samples. If a work is longer than 20 minutes, please submit a URL for an excerpt of 5–10 minutes along with a URL to the full piece. With each URL, please include title of sample, total running time, year of production, and a clear indication of your role in the work. Submit a URL to one time-based work, and documentation for two additional works (installation, sculpture, performance, etc.). For each non-time-based work, please submit at least one still image. However, if the work is better represented by multiple stills, you may add up to 10 per work. With each work, please include title of sample, total running time, year of production, and a clear indication of your role in the work. Have additional questions about the admission or audition process? Do you already hold a bachelor’s degree, but want to complete an additional undergraduate certification program? Peck School of the Arts offers certification in three areas: Art Education (EC-A), Music Education (EC-A), and Theatre Education (EC-A). The Post-Baccalaureate Teacher Certification Program is available for those who already hold an undergraduate degree in the corresponding content-specific area, and graduated with a minimum cumulative grade point average of 2.5. If you do not hold the corresponding content-specific undergraduate degree, you must instead apply as a second-degree seeking student. All interested applicants are required to meet face-to-face with their future department area head prior to submitting the university application. To apply, first review the list of required materials below. Obtain official transcripts from all institutions of higher education, technical colleges, schools, and programs (except UWM) and send to the address below. The transcripts should bear an official embossed seal and remain unopened/untampered in the institution’s original envelope. If you attended UWM, you may submit unofficial transcripts. Upload a single PDF including 10-15 examples of your artwork representative of the breadth and depth of prior undergraduate studies. Identify each image by media, size, and year of completion. Upload a resume that includes your educational background, work experience, special talents/skills, and other relevant experience with children. Do not exceed two pages. Upload copies of unofficial transcripts from all institutions of higher education, including technical colleges, schools, and programs (except UWM). Upload copies of Wisconsin or Out-of-State Education License(s). Upload any documentation that you may have received from DPI concerning any stipulations or license renewals that may pertain to your application or program requirements. There is no application fee to apply as a non-degree undergraduate. Please ignore the payment page and DO NOT MAKE A PAYMENT. Application Instructions | Carefully review instructions prior to beginning the University Application to ensure successful navigation and submission.